What causes blood spots in chicken eggs? Blood spots are the result of the rupturing of tiny blood vessels in the hen’s ovaries or oviduct. This area is full of tiny blood vessels and occasionally one will rupture during the egg making process. Many people believe that these tiny vessels rupture when a hen is startled or scared though this definitely hasn't been proven. 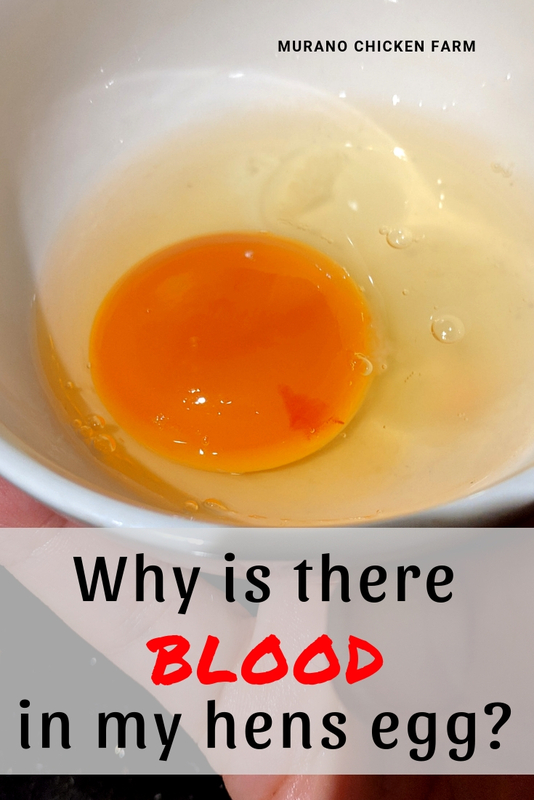 What do blood spots in eggs look like? 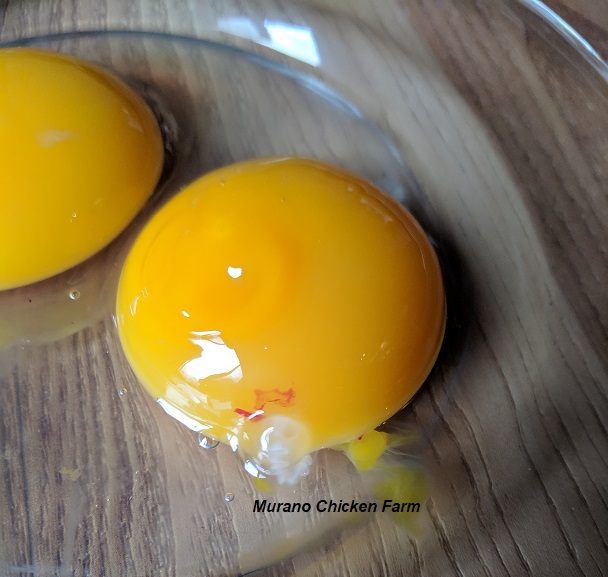 Blood spots vary from barely distinguishable spots on the surface of the yolk to heavy blood contamination throughout the yolk. 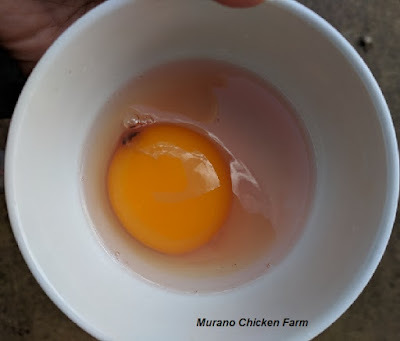 Occasionally blood may be diffused through the albumen or white of the egg. This is where it gets tricky, because blood spots can be quite different. I have been able to put them into 3 categories through my experience. This is generally a small dot of blood on top of the egg yolk. It can also be a small collection of blood dots in the same area. Or it could look like a small smear of blood wiped across the yolk. These eggs are edible, just scoop the blood out with a spoon or the tip of a knife. This one looks exactly as it sounds. Like a blood clot in the egg white. Usually attached to the chalaza close to the yolk. The chalaza is the white stringy tissue that suspends the yolk inside the egg. This egg is edible, just scoop out the whole clot with a spoon. In this case you'll open up the egg and the entire white will be tinged red. Sometimes a blood clot is present also. This is the only one that is inedible. You could probably scoop out the yolk and cook just that, but I usually just put these aside to cook for the chickens later. 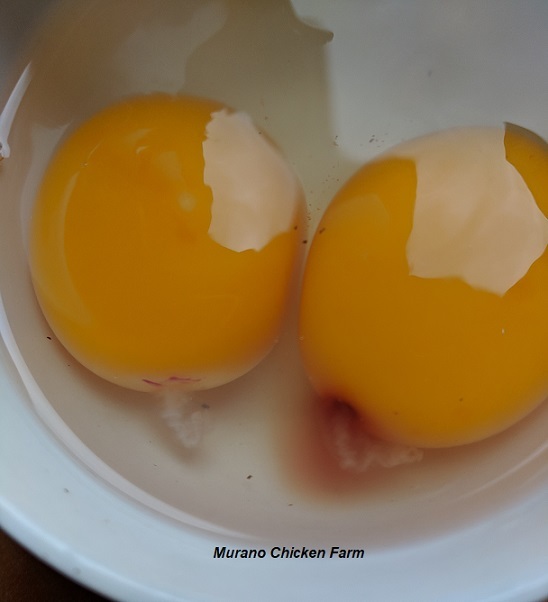 Blood spots are more common in hens that lay brown eggs than in hens that lay white eggs. They are also more common in hens that have had artificial light in their coop during winter. Heavy breed hens produce more eggs with blood spots than lighter breeds. Many people believe that a blood spot in an egg means that it's fertile. It does not. However, that belief isn't so far off. You see that started as one of those things people thought/said back in the day. "A spot of blood on the egg just means that the rooster was there." While we now know that it isn't a sign of fertility, the blood vessel rupturing could have been caused by an overly rambunctious roosters mating ritual. So...there could be a tiny bit of truth to that tale. Thankfully that blood spot in your hens egg is not a cause for concern. There is nothing you can do about it and it is not an indication of a bigger problem. It's a normal glitch in the reproductive system. It might look odd, but rest assured it's completely harmless. Want to know more about farm fresh eggs? Click here for more articles about raising hens for eggs!